Edgar Savisaar ning tema ustav toetaja, kunagine Lasnamäe vanem ja nüüdne riigikogu liige Olga Ivanova mullu augusti lõpus neid toetavasse linnaossa rajatud Tondiloo pargi avamisel. Six members of the Riigikogu from the ruling Center Party left last Thursday's Riigikogu sitting to protest Edgar Savisaar's exclusion from the work of the party and election efforts. The fear that between seven and ten members of the Center Party's 27-strong Riigikogu faction might hold onto grudges in favor of Savisaar after Jüri Ratas' rise to the head of the party and the government was there from the very first days of the coalition. While it seemed for a time that committee chairman positions and the long-awaited taste of power would be enough to pacify the so-called Savisaarians, moments of seeming injustice seem to be enough to rekindle old grudges. Tallinn's Lasnamäe borough is a key region for Center: the largest, the most important, and the strongest citadel among the party's 27 regions. The Center Party's Tallinn council set up Mihhail Kõlvart as the party's forerunner in Lasnamäe for the upcoming local elections last week. Edgar Savisaar's candidacy for the same position was set up by MP Olga Ivanova who remained the former chairman's only supporter in the ten-member council. Center Party faction head Kersti Sarapuu did not wish to comment on the protest and found that the party needs to solve its in-house matters in house. „Nothing dramatic happened, a lot of delegates were absent last Thursday (25 in all – T. K.), and no one has to worry about missing votes in terms of decisions that matter to the coalition. Chairman Jüri Ratas said that protest is a strong word. „I've discussed this matter with Erki Savisaar, and he said there was no antagonism,“ the PM said. Other members to protest Savisaar's absence included Oudekki Loone, Olga Ivanova, Peeter Ernits, Maarika Tuus-Laul, and Viktor Vassiljev. The latter gave Sarapuu and the party advance notice of the action. The Center Party's Lasnamäe area elected Savisaar its board member this week. While rumors say Savisaar came in fourth in the election, the message sent to the party brass is that he showed up and ran. „You've been away for so long we did not even expect your candidacy; however, we urge you to keep it up,“ several people from the area turned to Savisaar. „Yes, I'm still in politics, and why not!“ the politician replied. 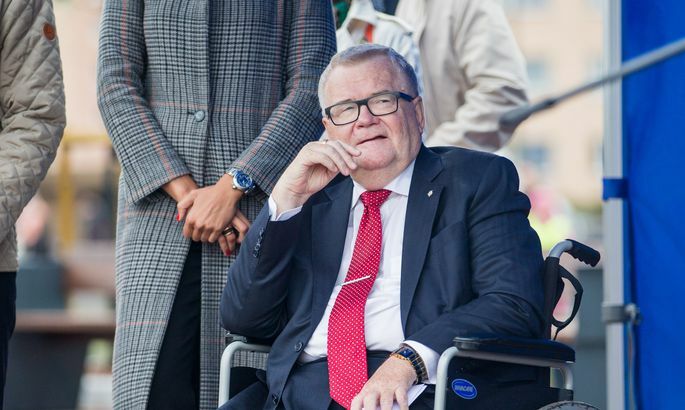 Party leaders' hope that Savisaar's name can be utilized by setting up his son Erki in Lasnamäe borough and that news from the court will leave the party unscathed during the election campaign might be premature. „There is no sense in rushing things at this point,“ Savisaar tells his confidants. He is exercising, getting used to his new bionic leg by climbing the stairs in Hundisilma, talking to people, and visiting the capital almost daily. Savisaar's €2,000 salary, fuel compensation, and the title of historical adviser courtesy of the party is not enough to keep him away from politics. Intrigue and machinations are dime a dozen in the Center Party. Savisaar is convinced that Center, IRL, and the social democrats agreed to also rule Tallinn when agreeing to a coalition last fall. To make that happen, it would be better for the triumvirate to make sure neither Savisaar nor Yana Toom would run in high places in Tallinn in the local elections as a landslide victory by Center would make a coalition look awkward. Center chairman Jüri Ratas refuted talk of an agreement. “We have not even discussed anything of the sort, not to mention agreements,” he said. “Tallinn will be run by whoever can win the trust of its citizens at elections”. The alleged agreement is bothering Tallinn's current leaders who do not want to relinquish their hegemony in the capital. Why settle for the position of mayor and two deputy mayors? And what to do with hundreds of city officials that form a link in the party's food chain? “No one dares say it publicly; however, this alleged plan has caused a lot of dissatisfaction,” one of the city's leaders admitted. Yana Toom hinted last week that it is more probable she will not be running in Tallinn. “When the esteemed chairman finds the time to contact me and discuss matters, I will perhaps decide something. It has not happened yet,” she said. In addition to tensions tied to Savisaar and the elections, grumbling can be heard coming from the party regarding the coalition's first 100 days in office. That Ratas has not managed to establish himself. “The prime minister has the responsibility, but he does not oversee the entire political spectrum or ministries regarding which it was hoped he could get them under control sooner,” one opinion goes. The Center Party, that finds itself in power for the first time in a long time, expects its election promises of altered e-voting, direct presidential election, countrywide free transport to materialize. Chairman of the Estonian Tenants' Association Helle Kalda presented the Riigikogu with draft legislation to introduce compensation also for successors of involuntary tenants bearing thousands of signatures in support in September, when Center was still part of the opposition. The subject matter has been the political bible of Heimar Lenk and Maarika Tuus-Laul. Lenk's calculations suggest more than €2 billion needs to be paid out. To pacify the opposing camp, Ratas' government decided to form a committee to tackle the unresolved issues of the ownership reform. The committee is chaired by Minister of State Administration Mihhail Korb (Center) with IRL's Minister of Justice Urmas Reinsalu acting as deputy chairman. Both Ratas and Korb realize that while it is all well and good to demand the distribution of €2 billion when one is in the opposition, once you're in the government you do not have €2 billion, nor are there any substantial grounds for its distribution.